This is Jet(3yrs.) and Donut(almost1)! They are so playful and loveable. 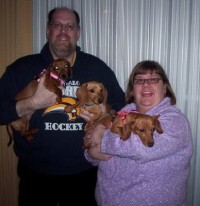 Thank you so much, Kim, for putting forth so much effort and raising beautiful Dachshunds! 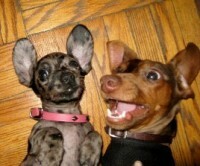 We are so happy with our Doxie Babies. I can’t imagine our life without them. We just wanted to let you know that Jack is great. 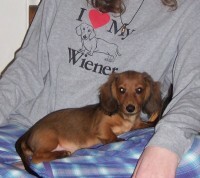 We thank you so very much for our adorable dachshund. 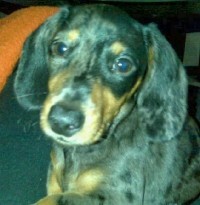 He loves to cuddle, is loveable and just like you said, gives lots of kisses. It is evident that you take very good care and give lots of love to the puppies. Hopefully we will make the trip to come get another in the future. I just want to say thank you again for the second addition to my family. Little Leelu is so sweet and loving, and is a cuddler just like Milo. They play together constantly, and keep each other company while I am away. 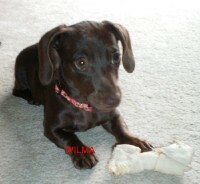 Just wanted to tell you Our Little Wilma is such a wonderful little girl. She is the perfect balance in what everyone would want in a puppy…..smart, clever, playful and a snugglebunny and most of all, simply down right adorable. You have done a wonderful job with your dogs in the past, and I am sure will continue in the future. 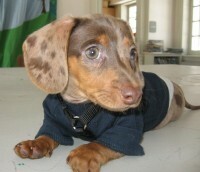 I would recommend you to anyone that would want a mini doxie. They, by far, are the best dog to have. Life isn’t complete until you have one or two. Thanks again.